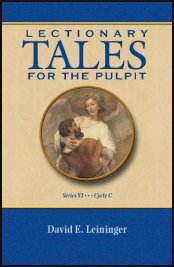 From the publisher's jacket comments: "This volume is just what any pastor needs when looking for something special to spice up a Sunday sermon - it's full of imaginative and inspirational meditations that breathe new life into scripture texts from Cycle C of the Revised Common Lectionary. Leininger gives readers a new perspective on a passage from each week's assigned readings with a thought-provoking reflection that puts in the context of modern life. This is much more than just a source of stimulating sermon illustrations - it's also a treasure chest of devotional reading that will make any reader pause and reflect on God's wonderful hand at work in our daily activities. It's a must-have resource for any church library."